The Colorado and Gila Rivers provide fine riparian and wader habitat east of Yuma. All the locations listed below are within ten miles of Yuma, and are easily accessed by 2-wheel drive. Go to the linked pages for detailed location instructions and to see what kind of birds you might find there. As you travel to the listed sites keep a look out for flooded fields that may have shorebirds and waders. During the winter also watch for raptors and sparrows. Each number corresponds with a birding site. Summaries of the sites are listed below. Clicking on the Site # takes you to a web page with detailed birding information. A small city park and a large area of surrounding wetlands is one of the best places to look for birds in Yuma. It has a wide variety of habitats. Good birds here include: Clapper and other Rails, White-faced Ibis, Least Bittern & other waders, Ladder-backed and other Woodpeckers, flycatchers, warblers, and Bronzed Cowbird. This backwater along the Colorado River was created by the Bureau of Reclamation in 1999. Depending on the season, you can find waders, shorebirds, and riparian birds. Look here for: Cinnamon Teal, Common Moorhen, and Blue Grosbeak. This large backwater lagoon along the Colorado River was also created by the Bureau of Reclamation. This is a great spot to find Osprey. Depending on the season, you can find waterfowl, waders, shorebirds, and riparian birds. Look here for: ducks, shorebirds, and Osprey. This grove of willow and cottonwoods along the Gila River is an excellent spot to see migrating warblers and flycatchers. It is one of the few places you can find breeding Yellow Warblers. 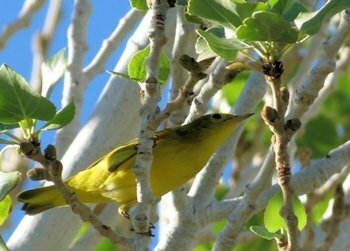 Some of the good birds to look for here are: Yellow, Hermit, MacGillivray's & Townsend's warblers; outstanding numbers of tanagers. A small lake surrounded by willows, cottonwoods, and mesquite just south of the Gila River. Another good spot for migrants. Permanent residents include Verdin, Black-tailed Gnatcatcher, and Blue Grosbeak. A new park on the north side of town, 100 acres of Colorado river-front property built on the site of an old landfill. Mesquite woods, cottonwoods, and several small ponds make up varied habitats that are proving very nice for birding.